Curtains Etc. 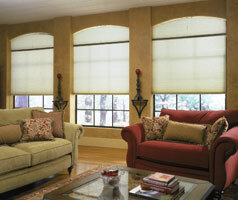 carries a complete line of cellular shades from Graber and Comfortex. These allow us to offer a wide range selection of features, textures and colors to meet your needs. As with all of our products we offer professional measuring and installation services. Graber CrystalPleat® cellular shades offer a variety of opacity levels for to get the right mixture of light and privacy with the highest degree of insulation. CrystalPleat offers a large selection of colors and materials to choose from. Features and options include, several wood valances, cordless lift systems, bottom up/top down systems and motorized shades. Click here to learn more about Graber cellular shades. 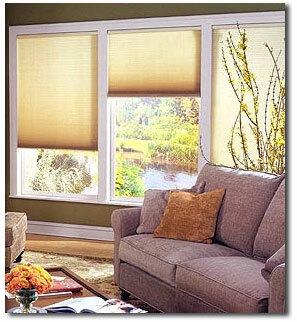 Comfortex has a large a selection of Cellular shades for most every application. Features of the Comfortex product line include single and double honeycomb cells, shades for large windows, specialty shapes, varying textures, blackout and semi-blackout, flame resistant, and cellular sliding shades. Click here to learn more about Comfortex cellular shades.